Because people still need our help. 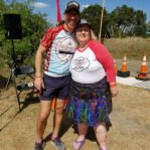 I'm going to ride my bike in the 2019 Hill Country Ride for AIDS, an awesome ride through the beautiful Texas hill country. This is the 20th anniversary of the HCRA - I've done every ride (not every inch of any Ride, but I'm there every year). They have raised more than $9,400,000 for people affected by HIV/AIDS in our community, and this year I want to help them raise even more!